Dr. Gregory Higby, the longtime Executive Director of the American Institute of the History of Pharmacy, will be retiring as of December 31, 2018. Dr. Higby has served as AIHP’s Executive Director since 1986 and has been a valued employee of the Institute since 1981. His many professional and scholarly accomplishments are too numerous to detail here, but they include editing 110 issues of Pharmacy in History, authoring dozens of books and journal articles about pharmacy history, and lecturing and presenting papers at numerous pharmacy and historical meetings around the world. 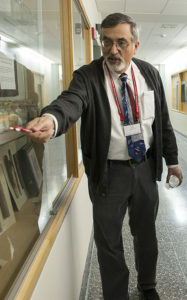 Greg Higby discusses pharmaceutical artifacts on display in Rennebohm Hall at the University of Wisconsin-Madison School of Pharmacy. In recognition of his scholarly work and writings, Dr. Higby has been elected to the International Academy of the History of Pharmacy, won the Edward Kremers Award for Pharmaco-Historical Writing, and received the Schelenz Medal from the German Society for the History of Pharmacy. He was also awarded the Distinguished Alumni Award from the University of Michigan College of Pharmacy. In addition to these accomplishments, for three decades he has led AIHP with skill, dedication, and unbounded good humor. While Dr. Higby will step down as Executive Director at the end of the year, he will continue to serve the Institute in another, part-time, capacity. Effective January 1, 2019, Dr. Higby will assume the title of Fischelis Scholar and in that role he will curate and catalog the Institute’s collection of reference materials, books, and artifacts. Dr. Higby also hopes to continue teaching the History of Pharmacy survey course at the University of Wisconsin-Madison School of Pharmacy. Dr. Higby’s many years of excellent service to the Institute will be recognized during the annual AIHP Business Meeting webinar on Thursday, November 15th and at other upcoming events in the next several months. We encourage you to email Dr. Higby at greg.higby@aihp.org to wish him well and to express your thanks for his leadership of the Institute. AIHP thanks Dr. Higby for his more than 35 years of service and leadership. Enjoy your retirement, Greg!